March, the month we’ve all been looking forward to since Christmas. Why? Well, for a start it’s only ten months to next Christmas, but mainly it’s the Vernal Equinox on the 20th (at 16:50 to be precise), and the clocks go forward on the 25th, which means that the Sun doesn’t set until half past seven and we can all start wearing shorts again. Right from the start, we can see the brightest of planets, Venus, over in the west, chasing the Sun into the glow of sunset. In fact, it sets just an hour after the Sun so you will have to be pretty quick to spot it and you will need a good view of the western horizon, although it gets better as the days go by. Mercury is nearby too, so see if you can join the small, select band of people who have spotted this tiny planet. Your best chance is on the 4th when it is conjunction with (very close to) Venus. Again, Mercury gets better later in the month and you simply must look on the 18th when Venus, Mercury and a very thin crescent Moon are all close together. Speaking of the Moon, there was no full Moon in February, so we get two of them this month, on the 2nd and the 31st, although neither of them are with the Moon at perigee or looking blue. It does do something rather special on the 22nd when it passes in front of a bright star. Unfortunately, it happens rather late in the evening and when they are very close to the western horizon, but you’ve already found a good view of that when you were looking for Venus. Looking out as soon as it gets dark, somewhere west of south, you can easily spot Orion. 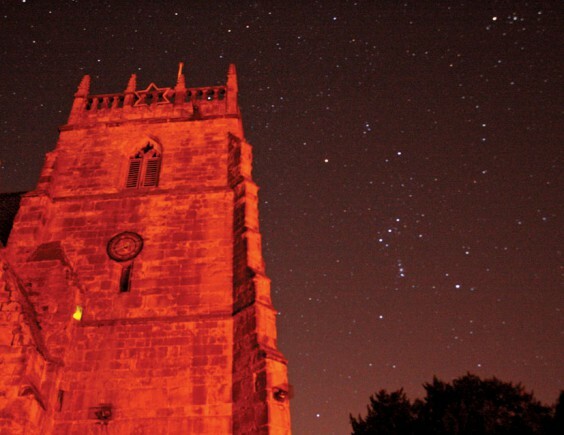 This is a huge constellation, half the height of Alvechurch’s church tower. Up and to the right is the vee of stars that form Taurus, dominated by the bright red star, Aldebaran. This is the star that the Moon occludes on the 22nd, a little after eleven thirty when it should just pop out of sight. The Moon is a chubby crescent so its leading edge is dark, adding to the effect. While you’re waiting, take time to have a good look at Orion. At the top left is the red supergiant star Betelgeuse, the largest star in the sky. At the opposite corner of Orion, bottom right, is Rigel. This is a blue supergiant, its difference in colour to Betelgeuse being quite striking. In the middle of Orion, hanging from his belt, is his sword, and the middle star of his sword is a bit indistinct. This is because it is a little bunch of hot, bright stars that have recently formed (relatively) from the cloud of gas that surrounds them. Try using averted vision (last month) to see it. Plenty to see then – the sky is a veritable visual activity centre!